Polaris RZR XP 900 Review. The Polaris RZR XP 900 is another step closer to a pure sports side by side. The Ranger RZR S was a huge step in that direction. The XP 900 kicks it up another notch. Even though it looks a lot like a RZR S with a long travel suspension kit, there are some major differences under the skin. The biggest news is an all new engine design. The Polaris ProStar engine is a new light weight vertical twin. We'll cover all the detailed specs a little later. For now, the hi-lites are 875cc, DOHC, four valve, liquid cooled, electronic fuel injected and 88 horsepower. Interested now? The Ranger RZR XP900 introduces a new level of performance. An all new transmission was engineered to take advantage of the new engine. It offers a more compact and lighter weight design, with a more efficient final drive arrangement to get more of that extra horsepower to the ground. The most obvious visual difference is the new long travel suspension. You'll get 13.5 inches at the front from the extra long dual a-arms. At the rear is a very Baja racer looking 3 link system. A beefy trailing arm with 2 radius rods gives 14 inches of travel. All that wheel movement is well controlled with premium quality Fox Podium 2.0 shocks with remote reservoirs. To learn more about the new Polaris RZR XP 900 and see some of these new features in action - check out the video below. The completely new ProStar series engine is the biggest news about the XP 900. This isn't just some bored out version of the 800 RZR S unit. No, this is a clean sheet design from the ground up. It is a vertical twin like the RZR 800, but that's where most of the similarity ends. The new engine is more compact, utilizes DOHC 4-valve technology,with larger valves for better high rpm performance. Liquid cooling and electronic fuel injection are retained from the older generation engine. All Polaris RZR XP 900 engines employ a 180 degree crankshaft arrangement. This fires one cylinder at a time, half a complete turn of the crank from each other. This firing order, along with the counter balancers, keeps the engine reasonably smooth. A different mounting position for the engine is also used, with the engine being placed transversely (across the frame rails) rather than longitudinally (in-line with frame rails) like the other RZR models. Power is a claimed 88 hp with an 8750 rpm redline. That's a lot more of both than than the RZR 800 or Razor S models. Along with the new engine, you also get an all new transmission. Lighter and more compact, while at the same time being stronger to handle the increased torque of the ProStar engine. Helical cut gears are used in the final drive to maximize efficiency and minimize power loss to the wheels. Polaris supplies a new high strength CVT belt to handle all the extra torque passing through the transmission. You can select from Park, Reverse, Neutral, and Hi and Lo range. Polaris chose not to include a proper parking brake on the XP 900. No big deal except when you have to park on an incline and the transmission gets stuck in Park. That can be an adventure sometimes! Front suspension on the Polaris RZR XP 900 is by conventional double a-arms with 13.5 inches of travel. Fox Podium X 2.0 shocks with adjustable dampening and remote reservoirs maintains wheel control. The Polaris Razor XP 900 gets an all new rear suspension. Things get more interesting at the rear. A 3 link design with a stout looking trailing arm and 2 rear mounted transverse radius rods bring a desert racer inspired set-up to a sport UTV. 14 inches of travel and the same model Fox shocks as the front gives you plenty to work with in the rough stuff. Maintaining stability in that rough stuff is important for any vehicle with this kind of performance potential. The 4 inches of extra width and 4.4 inches of longer wheelbase compared to the RZR S goes a long way to giving you just that. Brakes are 4 wheel disc with twin piston front calipers and cross drilled rotors for maximum stopping power. A strong looking wide brake pedal controls the action. One disappointment is the lack of a parking brake. 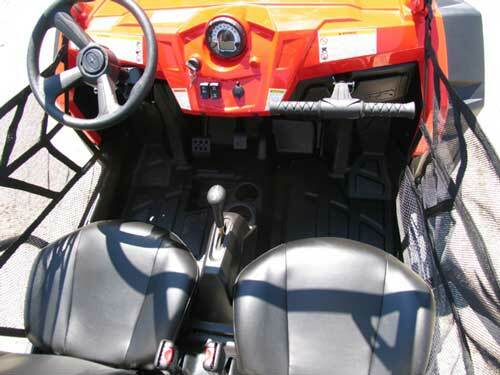 The RZR XP 900 interior may not be plush - but it is roomier than the RZR S.
The body of the Polaris RZR XP 900 looks a lot like a RZR S that has put on a few pounds. The extra bulkiness comes from extra shielding around the radiator opening and some rather serious looking fender flares. All the extra protection actually does a pretty good job. You notice much less muck getting to you when you're in the sloppy stuff. When you slide into the driver's seat, you'll be looking at a basic dash layout with a round analog/digital gauge in the center. Multiple functions can be monitored by scrolling through the digital readouts. Below the gauge is the ignition switch, rocker switches to select between 2 and 4 wheel drive, and operate the diff lock. a 12 volt accessory plug finishes off the center panel. A contoured steering wheel that has tilt adjustment greets the driver, while a sturdy grab rail jutting out of the dash keeps the passenger secure. A useful glove box can be found behind the grab bar. Shifting is done with a lever in the center console that is also home to dual cup holders. Bucket seats with 3-point harnesses and side door nets keep you where you belong. A sunken "heel box" in the driver's side floor helps keep your feet positioned for controlling the brake and throttle when the ride gets bouncy! You can see how all the components are packaged within the wheelbase for better handling and stability. The increased ground clearance and wheel travel are obvious. Exclusive Tires - ITP supplies directional lug tires that were designed exclusively for the Polaris RZR XP 900. The goal was to maintain better straight line stability and improved cornering at the higher speeds this RZR is capable of attaining (70+ mph). LED Headlights - That's right - straight from the factory hi-tech lights. These babies put out a lot more light than halogens while only drawing about half the current from the electrical system. Easy Maintenance - Easily removable panels in the bed grant access to the oil level check and filler. Another panel provides access to the new air filter that has 90% more capacity than the RZR 800. The coolant and brake reservoirs can be checked and filled with easy access under the front hood. The CVT belt can be checked and maintained with no hassle by removing a single cover. Nothing else needs to be disturbed. 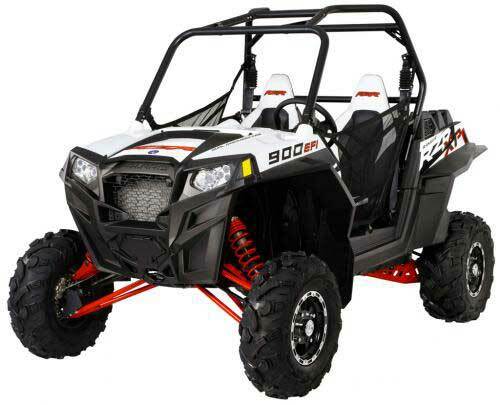 Check out the specs for the Polaris RZR XP 900, RZR 800 and RZR S here. New models tend to have more problems during their first production runs, and the XP 900 is no different. A couple of reliability issues and a complaint about drivability have cropped up. Nothing really that major, but just some things you should be aware of. Coolant hose - There have been several reports of coolant hoses leaking, and in some cases, blowing off. This problem seems to be related to hoses ballooning and loosening the stock clamps. Check with your dealer to see if there have been any updates. Right rear shock failures - Enough of these have been reported to be more than coincidental. The problem may be an exhaust pipe that is routed too close to the right rear shock and insufficient heat shielding. After repeated exposure to the heat, the seals in the shock are fried and start leaking. Needs power steering - Several new owners have complained about the steering effort, especially on lower speed tight trails. Short hops may be tolerable, but those all day rides could turn into an endurance test. There is a solution with a dealer installed or aftermarket power steering system. The only problem is it will cost you around $1,000 more. Polaris RZR XP 900 Conclusion. The Polaris RZR XP 900 will have some LE options. Here's the White Lightening. The $15,999 price may seem like a lot, and it is. The real question? Are you getting enough value to justify the price? The answer to that really depends on what you plan to do with the XP 900. If you like dunes, desert, or wide open trails, this XP 900 has unmatched performance at the moment. We think it would cost far more to start with another brand, or even the Polaris RZR S, and attempt to match the performance of the stock Polaris RZR XP 900. Tight, technical, and generally slower riding confuses things a little more. 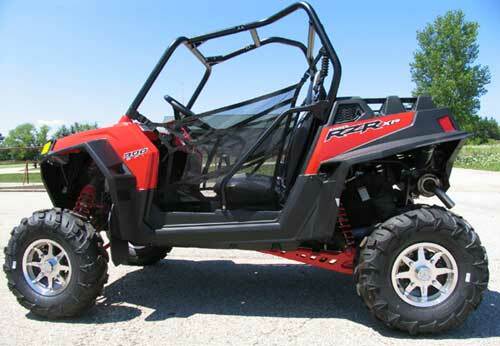 You can use the RZR XP to do it, but it becomes readily apparent that's not what it was designed for. The ride gets bouncy, the steering gets stiff, the engine gets a little hot, and the extra width becomes more hindrance than help. The other common use of side by sides is utility type chores, You can forget about that with the XP 900! It does come with a small pick-up box rated at 300 pounds of capacity, but that's it. No trailer hitch, no racks, no winch. So if you need to do chores, this ain't the ride for you. 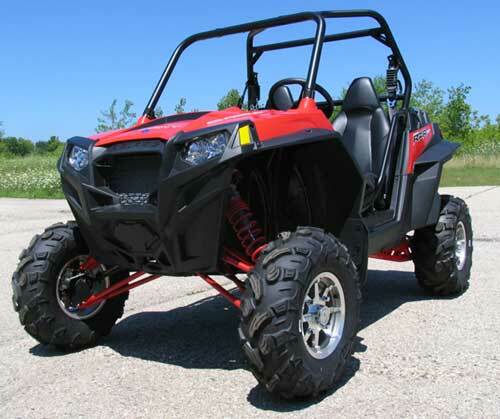 The Polaris RZR XP 900 does raise the bar for high performance side by sides. A lot. With that considered, we think this new machine represents a great value for the price, if it fits with the kind of riding you plan to do. Actually, when you think about how much other recreational vehicles cost - boats, street bikes, etc. - versus the amount of potential fun - we'd call the XP 900 a screamin' deal!